Bicycle hit and run claims in Los Angeles are up a dramatic 42 percent over the past 10 years according to statistics from the Los Angeles Times (see article here). As a bike accident victim’s attorney and advocate, it is something I am seeing more and more of these days. It is a frightening scenario: You are riding along a busy thoroughfare like Santa Monica Boulevard, you feel a bang, you end up laying on the roadway or sidewalk and the driver of the vehicle speeds off before you even know “what hit you” and you are left with trying to seek medical attention and treatment for severe injuries like fractures. It is scary to think it could happen to anyone but, it is playing out over and over again in L.A. County. These are the types of horror stories chronicled in the piece. Between 2002 and 2012, at least 5,600 cyclists were injured or killed in hit and run incidents. One in five bike incidents involving drivers fleeing the scene of the accident occurred in one of five neighborhoods: (1) Long Beach; (2) Santa Monica; (3) Downtown Los Angeles; (4) Van Nuys; or (5) North Hollywood. 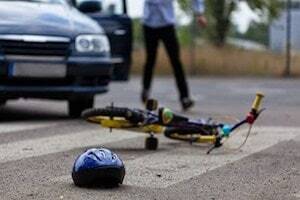 Young kids and teenagers form a disproportionate number of accident victims comprising almost 40 percent. Over 80 percent of the hit and run incident investigations by LAPD remain unsolved. How can Cyclists in Southern California Protect Themselves From hit and run Drivers? Try to get at least some information that may identify the driver of the vehicle: Local police agencies like LAPD and the L.A. County Sheriff’s Department state that the difficulty with investigating and prosecuting these claims mainly lies in lack of physical evidence that would tie the driver to the accident scene. Even partial license plate numbers are helpful to try to I.D. the perpetrator. Call 911 if you are injured. Try to get as much information from any eyewitnesses to the incident as possible including a description of the vehicle or driver involved. Follow up with police investigations and get as much information from investigators as possible. Check your auto insurance policy RIGHT NOW to determine if it may cover the costs of medical treatment and other damages: Many cyclists do not realize that their car insurance carrier may actually cover claims for medical expenses related to a bike accident. “Medical Payments” (or “med pay”) covers costs of basic medical care including emergency trauma care but, usually has a fairly low limit ($5,000 to $10,000 is typical for this type of insurance). More importantly, uninsured motorist coverage will compensate the victim of a hit and run the same as if you were involved in an auto v. auto accident on many policies. For example, if you have a policy with $100,000 in coverage, you could seek up to that limit amount through your own insurance. Uninsured motorist (“UM”) coverage is mandatory in every insurance policy issued in the State of California unless waived in a writing with very specific provisions provided for under the CA Insurance Code. When you are struck by an unknown driver and maimed or the cyclist is killed, it is difficult if not impossible to get justice. Police place a very low priority on these types of crimes and don’t always place a lot of resources to solving the crime. This is where a private attorney can be of great benefit to the accident victim or the family of the deceased. Private legal counsel can use private investigators and other resources to attempt to identify the driver. They are also essential even if you are only presenting a claim to your own insurance carrier. Although all claims should be promptly reported to the insurance carrier, the injured victim or their family should retain the services of a lawyer prior to making any formal statements or taking other measures. Presenting the claim in the proper format is essential in hit and run cases in order to prevent a denial of the claim. In addition, if the matter cannot be resolved via a satisfactory pre-litigation settlement demand, a formal arbitration process may be necessary. This would involve presentation of evidence to an arbitrator and request for an award which could then be enforced against the insurance company.